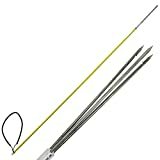 The Best Pole Spear For 2019 - Read This Before You Buy! Spearfishing is a sport that requires a great deal of skill. Nowadays most people do it with spear guns. With these, you’ll surely have more luck catching fish. The downside is you might also have a hard time improving your game. If you really want to learn the tricks of the trade, you might want to start with something more basic – a pole spear. Here are some of the best pole spear products you could choose! 1.1 New to Spearfishing? Check out this Pole Spears Overview! New to Spearfishing? Check out this Pole Spears Overview! Find the best kayaks for under $200! When it comes to spearfishing, Scuba Choice is one of the best brands you can pick. Their products boast both reliability and great performance. What follows are both the pros and cons of one of their best two-piece items! Made of quality fiberglass, this top pole spear is at once sturdy and lightweight. Since it’s a two-piece item, you can always disassemble and stuff it into a suitcase. To make it even better, this product comes with its own bag. Its total length is five feet, including the tip. When disassembled, each of the two pieces is 24 inches. The paralyzer tip is 12 inches long and equipped with three prongs, which gives this weapon a lot of power. Since it’s made of stainless steel, you won’t have to worry about it getting covered with rust. This helps make it the top pole spear. This Scuba Choice pole spear has one flaw. Although the material is sturdy, it gets worn down with time. This results in unpleasant fiberglass splinters. But even despite that, this is one of the most highly rated pieces of spearfishing gear, probably the best pole spear you’ll find. NOTE: MAKO Spearguns only sells our products direct to you, the diver. We DO NOT sell to resellers, nor do we authorize any resellers including PositiveThinking2. If you aren't buying direct from MAKO Spearguns, you aren't getting a new, unused MAKO Spearguns product backed by our service & support! You MUST click OTHER SELLERS to choose MAKO Spearguns as your seller! Includes: Three interchangeable sections for 3 different pole spear lengths. One 5 prong cluster (paralyzer tip) with "sure grip" barbs on each prong. One full length MAKO Spearguns Latex Power Band for 3 pc and 2 pc hunting. MAKO products are among the most highly rated pieces of spearfishing pole gear. They’re made of top-quality materials and boast amazing performance. 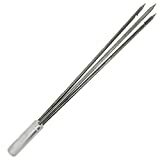 But don’t take our word for it – check out the review of this three-piece pole spear! Unlike other items on this list, MAKO’s model pole is made of anodized aircraft aluminum. Basically, this means it’s resistant to rust and provides the highest level of sturdiness. What’s best of all, it won’t ever give you splinters. The pole itself can be broken down into three individual pieces. This makes it a great travel spear as it can be moved easily. Each piece is only 27.5 inches long, which makes for the total length of 6.58 feet. Thanks to this, you can store and carry it around with ease. The connecting joints are reinforced with recessed flush screws. This makes the product even more durable than it would’ve been otherwise. The spear is equipped with a paralyzer tip that has five prongs. Although it’s a great piece of gear, MAKO’s pole spear couldn’t be called flawless. Some users say its tip isn’t as tough as it should be. Allegedly, it’ll bend a little if you happen to hit a rock with it. Other than that, this model comes highly recommended by experienced spearfishers! The following three products are all made by Scuba Choice. This can be seen as yet another indicator of how good this brand really is. After reviewing their two-piece spear, we’ll move forward to the first one-piece item! One-piece spearfishing pole spears tend to be cheaper than those made of two or more pieces. It’s the same with this one. Its total length is five feet, which is great for fishing in clear water. This is because the fish will be able to see you at larger distances. And you don’t want to scare them away before you’ve even started. While the pole is made of fiberglass, the tip is stainless steel. It’s a basic single barb tip that’s 12 inches long. To make fishing easier for you, this item’s equipped with a rubber sling. Since it’s made of only one piece, you won’t be able to disassemble this spear pole. Although this doesn’t affect its performance, it makes it more difficult to carry around. All in all, however, it’s a solid choice, especially for beginners! Another one-piece from Scuba Choice, this pole spear is well-known among professional spearfishers. It’s because it’s both affordable and of high quality. Let’s see how it could help you improve your skills! Made of sturdy fiberglass, this item is meant to last. Its total length is six feet. While the pole itself is five feet long, the tip has a length of 12 inches. The latter is made of stainless steel, which makes it resistant to rust. This means you’ll be able to use it without worrying about potential damage. The paralyzer tip is equipped with three individual prongs, which increases the chances of actually hitting the fish. 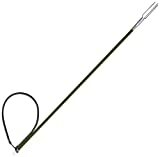 Since it also has a rubber sling, you’ll find it a lot easier to use than many other pole spears for spearfishing. Probably the biggest complaint users have about this pole spear involves the tip’s efficiency. The paralyzer tip is supposed to paralyze the fish, but it seems it doesn’t do it very well. Apart from that, most people say it’s a solid piece of spearfishing gear! Total length: 3.5ft. 3 Prong Lionfish Barb tip: 6" long. And last but not least, this one-piece item is also made by Scuba Choice. Its biggest advantages are affordability, reliability, and good performance. Let’s check out some of its features to see whether this holds up! Just like all other Scuba Choice products, this pole spear is made of fiberglass. 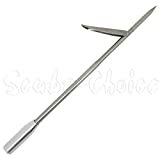 This makes it a durable item, especially considering the stainless steel tip. The total length of the pole is 4.5 feet. This is a bit shorter than the previous item, which makes it better for muddier waters. The tip is removable and six inches long. It’s of the lionfish barb type, meaning it has three prongs that go around in a circle. Some users prefer these, but it’s mostly a matter of taste and which type of fish you’d like to catch. The biggest disadvantage to using this spearfishing pole spear is that it’s not good for bigger fish. Aside from that, you’re probably going to love this Scuba Choice one-piece, one of the best pole spears and best spearguns. Spearfishing is becoming more and more popular and if you’re considering trying it 2019 is a great year to start. Whether you choose a reel listed here or not we believe Scuba choice has some other awesome pole spears you can check out. We hope this guide will help you find the best pole spear for your needs.